Keeping your teeth as clean as possible is an investment that will pay dividends for a very long time down the road. You’ll avoid costly cavities, gingivitis, and the dental operations required to fix those problems. Of course, keeping your teeth clean is a task that’s easier said than done, especially given the amount of misinformation on the web today about the best toothbrushes that can help you to keep your teeth clean and plaque-free. That’s why we’ve compiled this special report on the best electric toothbrush under $50: the Philips Sonicare HX5610/30 Essence. If you’re on a tight budget, this toothbrush is the ideal one for your dental needs. Let’s have a look at why the Sonicare has earned this prodigious position, and why you should opt for it over the competition. When it comes down to it, the more money you have available to invest in a toothbrush, the better off your teeth – and wallet, in the long run – will be. 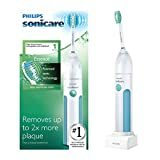 To that end, we’ve selected the Philips Sonicare HX5610/30 Essence as one of the best electric toothbrush picks for those of us who are on a shoestring budget but still want the cleanest teeth possible. When you’re shopping for a toothbrush in this price range, you’re definitely going to want to do your research. That involves taking a close look at a given toothbrush’s capabilities and seeing if it has the capabilities to handle your dental needs. We’ve made your life easier by doing all the hard work for you – read on to learn more about why you should – and shouldn’t – invest in your very own Sonicare electric toothbrush for your personal dental hygiene needs. For a toothbrush that’s under $50, you might think that the Sonicare doesn’t have the specs to handle difficult dental situations. But, you couldn’t be further from the truth: the Sonicare HX5610/30 Essence has everything you need and more to maintain a clean mouth. However, it does have some draw backs, which we’re going to discuss below. Let’s take a look at the bad news first, then see why you might want to opt for it over others in this price range. As a lower-end toothbrush, it may not give you the power you need to effectively clean your teeth and prevent the build up of plaque calculus and other dental issues. Due to being on the low end of the price spectrum, it may not last as long – even after replacing the battery. It’s not going to have all the bells and whistles of its more expensive sibling, the Healthywhite brush. It’s cheap, fast, and effective – the perfect trifecta of dental health. As an electric toothbrush, it’s up to two times as effective as manual brushing action, meaning you’ll be more able to prevent the buildup of plaque. The design of the Essence’s brush gives it the ability to get between your teeth, just like floss. A built-in timer gives you the ability to accurately judge how long you should brush your teeth. Without a doubt, the Sonicare Essence is one of the best toothbrushes on the market today for those individuals looking for an effective dental cleaning solution under $50. Although better options exist – namely, the Healthywhite brush – the Essence gets the job done without needing all the bells and whistles more expensive brushes might come with. Go out and get your own today, and let’s you get started on the path to full dental health. After all, cavities and gingivitis have no place in your life – the Sonicare Essence will keep it that way.